The antimesenteric portion of the fallopian tube (the side of the tube away from the blood supply within the broad ligament or mesosalpinx) is opened along the site of the ectopic pregnancy to un-roof the tube and expose the pregnancy that has been developing between the inner lumen of the tube and the outer serosa (sheath). 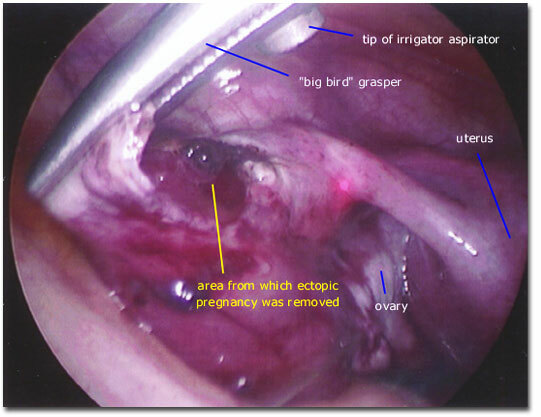 In this photograph, the pregnancy tissue has been removed and the remaining fallopian tube seems to have an intact inner lumen. Gentle hemostasis must now be secured to optimize the future reproductive potential of this fallopian tube.